Thank you very much for your interests in studying Watsu. No matter what background you may have, I believe you will find Watsu to help you enhance your professional life as well as personal life. Watsu can change how you move your body, how to be with your breath, how you touch someone, how to be with someone, and how to be with yourself. Watsu training is about awareness. Water brings so much awareness within you and water delivers it to others. Enjoy the water. Enjoy the oneness. Welcome to Water Family around the world. We are an official training institute of WABA, Worldwide Aquatic Bodywork Association. Toru Ogasawara is the only Watsu instructor in Japan and his Watsu 1 and Watsu 2 classes are credited by WABA. We also invite WABA instructors from around the world to do classes in Japan, which are also credited by WABA. When you study these classes with us, your credits will be recorded in WABA Registry for your lifetime, and all the WABA instructors around the world can see your records and will help you take further education with them. It’s the same system all over the world. 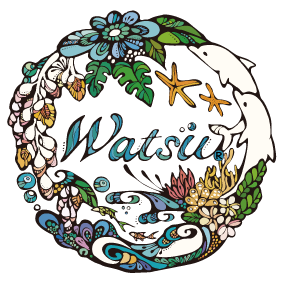 Watsu is an international service mark. It is a privilege to those who completed the regulated trainings to give professional sessions. WATSU 1is the first 50-hour Watsu class, in which you learn the half of the Watsu sequence, a progression of moves and positions that all Watsuers have the foundation on. We especially emphasize on your awareness and body mechanics. WATSU 2is the second 50-hour Watsu class, in which you complete the Watsu sequence. Watsu 2 moves involve a lot of body work and massage in all the positions you have already learned in Watsu 1. This is the time to refine all your application of Watsu sequence. We especially emphasize on your touch and presence. WATSU Provider Trainingis a supplemental class (WABA 50 hours) which is required to take after Watsu 1 and 2 to get certified as Watsu Provider by Okinawa Watsu Center. (If you get certified by other training institute, you must fill the requirements and supplemental classes that each training institutes have. – Demonstration of mastery on Watsu sequence. – Introduction of free flow to meet different body types and patterns. – How to access, separate, mobilize, stabilize, sequence and integrate. – How to start off your session by “melting the ice” with a rigid body. – How to strategically structure your sessions. – Contra indication. Contra actions. Emergency preparation. Basically, we do Japanese class in Okinawa, and English class in Taiwan. Taiwan Watsu Center has been kicked off in 2016. We go there to teach in English (which is sometimes translated into Chinese). They have classes once in June and once in October. They have their own organizer. Contact directly for more details. We can not have English speaking students in our Japanese class in Okinawa. The language cannot be mixed in the same class. If you have 2 or more English speaking students for a same class, we will open the class in English on your request. If you are interested in studying with us in English and in Okinawa, please let us know you want to be on the waiting list. We will hook you up to someone to share the class when we can, and we can discuss the date to open the class. Click the code button to see class details. WABA certified Watsu Instructor and Practitioner, Waterdance Practitioner. AsiaSpa magazine featured Toru Ogasawara in its May edition 2013. The thorough interviewed article describes his career very well.